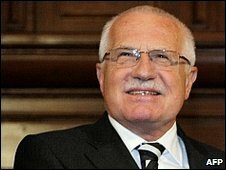 The Czech constitutional court has ruled that the Lisbon Treaty is in line with the constitution, clearing the way for President Vaclav Klaus to sign it. The Czech Republic is the only EU member yet to ratify the treaty, and the decision removes the penultimate hurdle to its passage. The Eurosceptic Mr Klaus, who was awaiting the court's decision, has said he will not further oppose the treaty. The treaty was drawn up to streamline decision-making in the 27-member body. Its supporters say it will allow the bloc to operate more efficiently and give it greater influence in world affairs. Critics say it will cede too many national powers to Brussels. If Mr Klaus signs, that will pave the way for the treaty to come into effect throughout the EU as early as 1 December. "The Treaty of Lisbon should now enter into force by the end of the year," said European Parliament President Jerzy Buzek. The Czech president has been seen as the last major obstacle to the passage of the treaty, but he has recently appeared satisfied with a promised opt-out from the EU's Charter of Fundamental Rights. Mr Klaus has said the opt-out was essential to avoid property claims from ethnic Germans, 2.5 million of whom were expelled from Czechoslovakia after World War II. The BBC's Rob Cameron in Prague says no-one knows when Mr Klaus might sign the document, though it looks like he will have no reason not to. The Czech constitutional court had been considering a case brought by 17 Eurosceptic senators who said the treaty would create a super-state, and as such would infringe Czech sovereignty. Following the court's ruling on Tuesday, Czech Prime Minister Jan Fischer said he was satisfied with the verdict, adding that there was now "no obstacle to the ratification". The Lisbon Treaty replaced an earlier draft constitution, which was rejected in referendums in France and the Netherlands in 2005. It would create the post of a new European Council president who would serve a term of two-and-a-half years. It also provides for a new foreign policy chief, combining the posts of the existing foreign affairs representative and the external affairs commissioner. European Commission President Jose Manuel Barroso said he hoped the EU could move "as quickly as possible" to make appointments to the new posts following the Czech court's ruling.